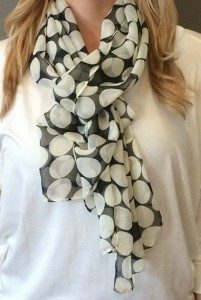 Spring Polka Dot Scarf Only $5.99! You are here: Home / Great Deals / Spring Polka Dot Scarf Only $5.99! It’s time for us to start thinking of our Spring wardrobe and here is a great deal on Jane that is just what you need for that added “pop”! Spring Polka Dot Scarf Only $5.99! Available in 3 colors grab one of each! Get this and other great deals every day at Jane!